Sea Lions Tonight Gone From Summer Nights? Things get hotter as the sun goes down here in Orlando, especially at SeaWorld Orlando for Summer Nights! 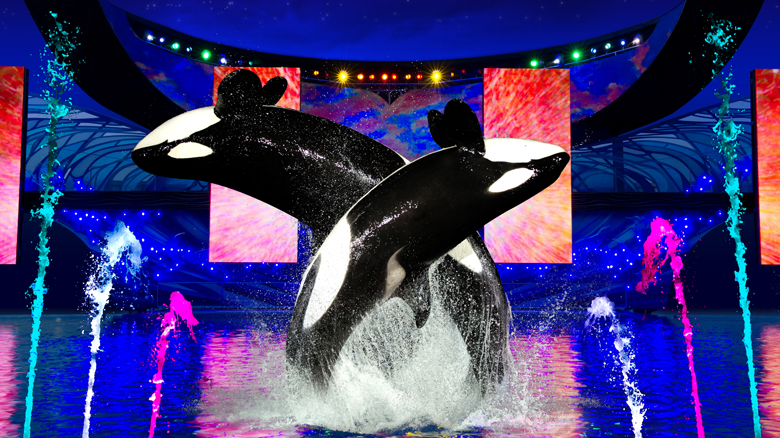 For those who do not know, Summer Nights at Seaworld starts on June 20th, 2015 this year and runs until August 9th. This event keeps the park open late, allowing guests to enjoy speciality shows, music, fireworks and food! Summer Nights is a nighttime spectacular and the best place to be when the sun sets over SeaWorld. Celebrate summer with exciting, nighttime shows, including the all-new Shamu show Shamu’s Celebration: Light Up the Night, and our thrilling coasters under the stars. Normally included in this line up is Sea Lions Tonight. Sea Lions Tonight was a parody show that the Sea Lions, otters, and walruses put on nightly. This show made fun of other shows, rides and even the big guys Shamu! For me this show was one of my favorites due to the comedy as well as the playfulness of the animals. When Clyde and Seamore shut down last year the question was in the air if Sea Lions Tonight would come back the next year. I have been checking Seaworld’s website and no official schedules have been posted. However, I have noticed that there is no mention of Sea Lions Tonight on the website and while talking to workers at the new Sea Lion High show. Also one of the shows that was spoofed is now gone when Alure shut down. I am not sure what the future of Summer Nights will be, but I know I will be disappointed if Sea Lions Tonight does not come back to Seaworld Orlando this year! What about you? If the show does not come back does it affect you at all? Comment and let me know!